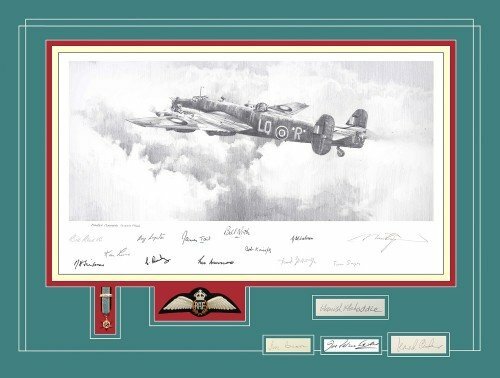 To celebrate forty years as the world's foremost aviation publisher - Robert Taylor's publisher is delighted to present the first in a series of Robert Taylor Masterworks specially released from the archives of the Military Gallery. On 25 April, 1945, RAF Bomber Command despatched a force of over 300 Lancasters to attack The Eagle’s Nest, Hitler’s personal retreat high in the Bavarian Alps. 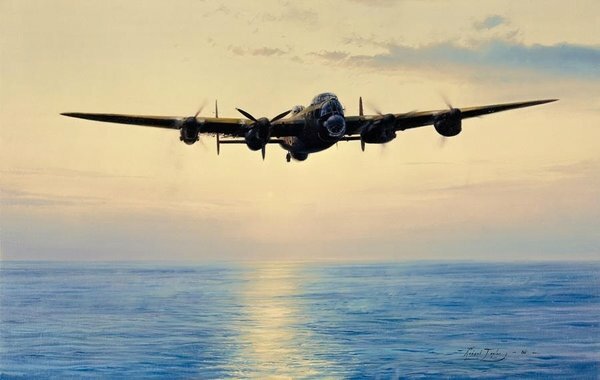 It was a symbolic operation because the war was all but over, nevertheless it was highly appropriate that after six years of savage aerial combat it was the Lancaster bombers and aircrew of Bomber Command that were chosen for the task. The first operational Lancasters arrived with 44 Squadron at Waddington on Christmas Eve 1941 and it was quick to establish itself as the backbone of Bomber Command. By the summer of 1944 this legendary bomber, powered by four mighty Merlin engines, equipped over 40 squadrons and was as tough as the crews that flew it – men from Britain, Canada, Australia, New Zealand, as well as other Commonwealth countries along with many nations under the threat of Nazi rule. Despite facing appalling conditions and some of the worst casualty rates of WWII, every man was a volunteer, each part of a special breed of heroic young men whose dogged resilience in the face of danger is expertly captured by Robert Taylor in his previously unseen painting, Coast in Sight. With one engine out and serious damage to the starboard wing, a Mk.III Lancaster struggles to maintain height as the crew coax their battered aircraft slowly home after a gruelling night bombing mission to Germany in the autumn of 1944. With the English coast now in sight, safety is within their grasp and the crew’s perilous journey will soon be over. Completed in 1986 this moving piece joins the library of other major editions undertaken during this period, classic works such as Bombers Moon, JG-52 and Last Flight Home.